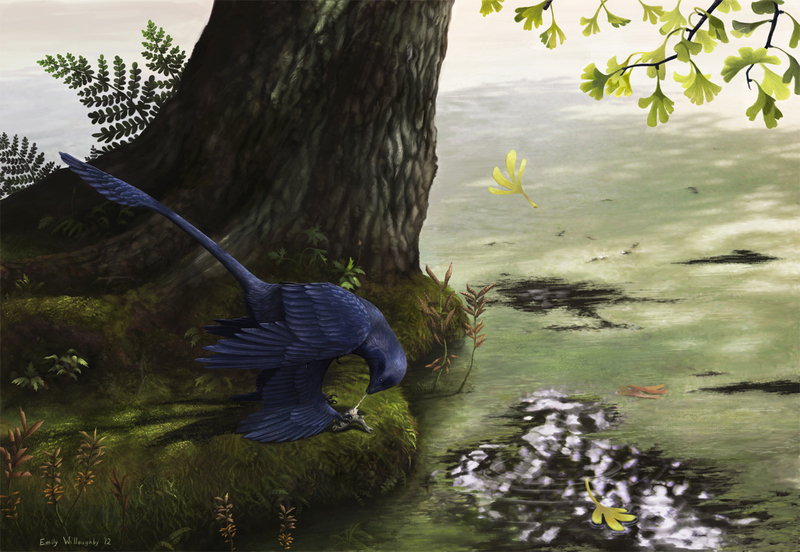 This is a life restoration for Xing et al 2013 of the tiny, iridescent four-winged dromaeosaur Microraptor eating a fish, the osteoglossiform Jinanichthys, near a swampy Jehol pond. The illustration is based on a new specimen described as having the skeletons of 3-4 of these fish preserved in its gut. 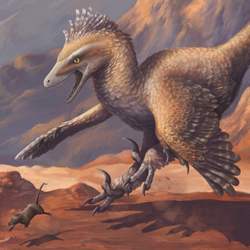 This study is important because it demonstrates that Microraptor was probably a generalist predator, capable of preying on on a wide variety of small animals. Previous specimens have been found with evidence of a scansorial mammal as well as an enantiornithine bird preserved in the gut, but this is the first instance of Microraptor stomach contents that takes it out of the trees by necessity and places it on the ground, near water. The illustration incorporates a lot of research. 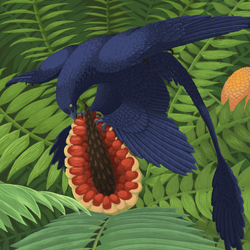 The iridescent color of the animal is modeled after the Li 2012 color study on a Microraptor specimen, which detected fossilized melanosomes consistent with the iridescent black in some modern birds. The two long tail feathers were not preserved in this specimen, so were left off by request of the authors. The manner with which the Microraptor is grasping the fish is based on the Fowler 2011 study on dromaeosaur prey restraint, which analyzed the pes and leg proportions of deinonychosaurs and found them to be extremely similar to those of modern birds of prey, indicating that the animals likely grasped smaller prey with its feet while tearing at it with its mouth. The plant life in the background is modeled entirely after known plant fossils from the Jiufotang and Yixian formations, including the aquatic seed plant Archaefructus and the eudicot Leefructus, as well as the ever-present Ginkgo apodes. The nearby pond sports an algae bloom, a phenomenon that was probably quite common in early Cretaceous ponds, as blooms are often caused by falling volcanic ash.